What is the fundamental idea behind product life cycle? Product life cycle is very similar to a life. A living being is first born (introduction). Then it grows through its youth (growth) to become an adult (maturity). When it gets old, it declines both mentally and physically (decline), after which it eventually dies. An analogy to this process can be observed in production as well. First, a product is being developed. After we know what it is that we are selling and what the customer wants, we introduce it to the market. As our product becomes known by consumers, it grows until it establishes a solid position in the market. At this point, our product is mature. After a period of time, the product is overtaken by development and the introduction of superior competitors. Then it goes into decline and is eventually withdrawn. All these phases together are called product life cycle. What is the official definition of a product life cycle? Business strategy and performance is affected to a great degree by life cycle stages of a product or service. Business priorities, budgeting, funding, production, distribution, marketing -- all these production aspects change depending on how long a product or a service has been in the market. The product life cycle method identifies the four (five) distinct stages affecting sales of a product, from the product's inception until its retirement. In the Introduction stage of the product life cycle, a product or a service is introduced to the market. This stage involves focused and intense marketing effort designed to establish a clear identity and promote maximum awareness. Consumers are testing the product in this phase. After a product is introduced in the market, consumers become more interested in it. This is called the Growth stage of the product life cycle. Sales are increasing and competitors are emerging as well. Products become more profitable and companies form alliances, joint ventures, and takeovers. Customers are accustomed to the product and are starting to purchase it repetitively. Marketing efforts and costs are still significant. Advertising costs are high. Market share tends to stabilize. The market has reached saturation. Some producers at a later stage of the Maturity stage of the product life cycle begin to leave the market due to poor profit margins. Sales dynamics is beginning to decrease. Sales volume reaches a steady state supported by loyal customers. Producers attempt to differentiate their products. Brands, trademarks, and image are key tools in this production life cycle stage. Price wars and intense competition are common. Continuous decline in sales signals entry into the Decline stage of the production life cycle. Competition is taking over your market share at this point. Economic and production conditions are becoming unfavorable. Introduction of innovative products or a change in consumer tastes is common reason for a decline. There is intense price-cutting and many more products are withdrawn from the market. Profits can be improved by reducing marketing and cutting other costs. Why is it important to know the product life cycle? Any for-profit business is constantly seeking ways to grow future cash flows by maximizing revenue from the sale of products and services. Positive cash flow allows a company to invest in development of new products and services, to expand production capabilities, to improve its workforce, and so on. It is most companies' goal to acquire key market share and become a leader in its respective industry. A consistent and sustainable cash flow from product that is well established and stabilized is the key to any long-term investment. And knowing the product life cycle can help with this. Does every product follow the same product life cycle curve? No. It would be very easy if every product went through the same fate or product life cycle. Most products in developed markets fail in the introduction phase. Their product life cycle is very short, and they do not even make it to the maturity stage. 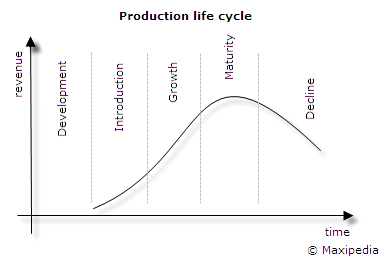 We can also find products with cyclical maturity phases. A product enters the decline phase of the product life cycle where it is promoted to regain customers again. If costs of getting the product back to the top of the market are small, and the product is well positioned or even protected from major competitors, then we talk about a cash cow. This concept is further explained in the BCG matrix model. What are the trends in product life cycle? One most observable trend is that product life cycles are becoming shorter and shorter. This is given mostly by ever-increasing competition (see Michael Porter's Five Forces model for more on competition). While a manufacturer of pots and utensils faced competition only from another manufacturer in the same city hundreds of years ago, a pot manufacturer these days faces competition from many companies on the other side of the globe in addition to other local manufacturers. Everyone is trying to come to the market with innovations. Many products in mature industries are revitalized by product differentiation and market segmentation. It is not uncommon that companies try to find new niches and market segments when they see their product is about to enter the Decline phase. Companies are becoming very flexible in their ability to reassess product life cycle costs and revenues. Even though product life cycles shrink, the operating life of many products is becoming longer. While a 10 years old car would be considered a wreck in 60's, today's cars are relatively very durable and their life time is extending. Companies have to take product operating life into account and adjust their planning accordingly. Companies are attempting to optimize product life cycle revenue and profits through warranties and upgrades to existing products. Where can I find more information about Product Life Cycle? You can ask questions and find answers about Product Life Cycle in our management discussion forum.